I’ll start this post off with a statistic I learned on passion-flower.ca: One in five adults suffers from anxiety or nervous tension and feel overwhelmed by life’s daily demands. I am one of them. I’ve written about my anxiety issues before and how it’s a daily battle for me. I have good days and bad days. It’s something that I’ll probably always struggle with but I”m working really hard on getting it under control. We’ve been told over and over how stress can wreak havoc on our bodies. It takes away our sleep, appetite (in some instances), makes us feel tired and robs our joy. Yes, stress is normal, but too much of it can feel so overwhelming. Have you ever had those nights where you are so tired, but your mind will not shut off no matter what? You try to count sheep, watch TV or read and nothing is working. Thankfully, my sleep is pretty good and I only have nights like this every couple weeks. I end up staying up till 4 am looking at the clock wishing I could just sleep already! The next day is always brutal. I don’t like taking prescription medication and prefer to try a natural approach which is why I figured I’d try an herbal remedy sleep-aid, Pascoflair. I’ve used herbal medicine in the past for other conditions with some success. 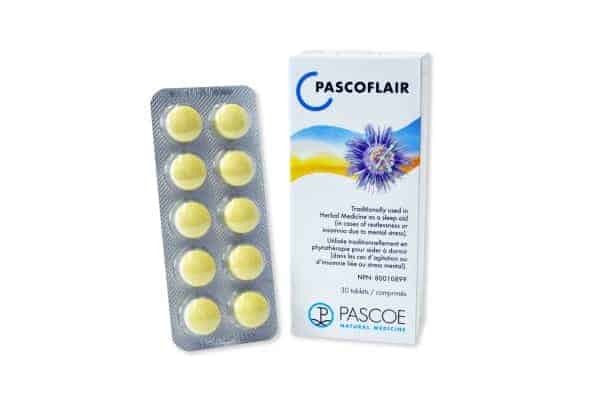 Pascoflair contains pure Passionflower extract which has traditionally been used in herbal medicine to help insomnia due to mental stress and restlessness. It helps to promote relaxation, concentration and give you a better night’s sleep. I’ve got a lot on my plate right now personally and have been under more stress than normal for the past couple months. John’s is being medically released from the military in a couple months and we’ve got so much to do to prepare for that. I always feel like I never have enough time during the day to get everything done that I need to. I seem to have a lot of those days where there’s lots to do but not much gets done because I get side-tracked or interrupted. Then at night, I lay in bed thinking about what I still need to get done! It’s a cycle I need to break! On one of those nights where my mind would not shut off, I took a Pascoflair tablet and was anxious for some relief. It did seem to help me calm down and relax and I was able to fall asleep after a little bit. I woke up the next day feeling great. I’m keeping the box of Pascoflair in my nightstand drawer for the nights I need it. I’m glad it’s there! I appreciate that it’s all-natural, not addictive and that works well for me. Check out this store locator to find a store that carries Pascoflair near you. Visit Pascoe Canada to learn more and as always make sure to discuss any medical concerns you have with your doctor. I like that Passionflower’s effects can be seen within a half hour of use! I also like that it is non-addictive. I could use this every now and then. I learned that the flower is grown in the US. And that the latin name is incarnata. Anything that could naturally help me sleep would be awesome!!! I have passion flower growing in my neighbors yard here in Winnipeg,….could I use it??? Woooo this sound like exactly what my husband needs. On the website I learned he has some of the symptoms of nervous unrest. Can’t sleep at night, keeps waking up, can’t concentrate during the day – I know that’s 2 but boy does he have them. It promotes a state of relaxation. I learned that if anxieties are not treated, conditions of nervous unrest become greater over time. I learned that not only can it help you sleep it can help with anxiety, and can grow in almost any climate. Oh my goodness this sounds too good to be true! I need to try this ASAP! I found out that Passionflower is effective within an hour of taking and is non-habit forming. I learned that passionflower acts as a natural anxiolytic. The extract has demonstrated positive effects on nerve messengers, thereby strengthening the nervous system. I learned that there is more than 525 species of Passionflower health professionals only use 1 of them. I learned a very useful bit of important information. This has no known interactions with other medications. I learned that one way to deal with nervous unrest is to bring a clear structure to your daily routine. Tips and strategies for coping with lifes daily pressures and anxieties. No side effects is great! I learned that the product strengthens GABA’s effectiveness, thereby promoting a state of relaxation. I like that passionflower works with one hour of taking it and is non habit-forming. I learned that Passionflower has the natural ability to bring you inner calm.